Carolyn Pitre, centre, with staff at the Scotiabank at Kingston Road and Bingham Avenue, as they celebrate her retirement. Photo by Trisha Sales. The staff gets ready for Carolyn Pitre’s party. A celebration that will open a new chapter of life. 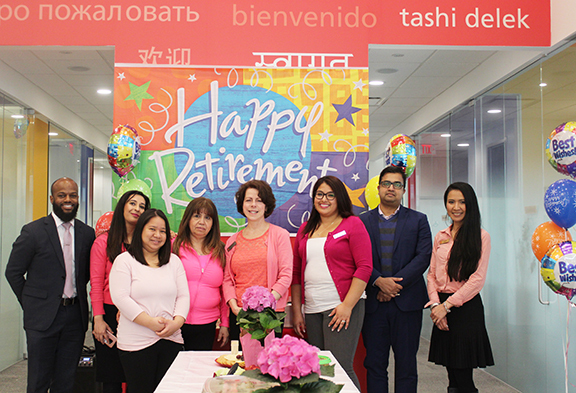 She worked at Scotiabank for 30 years and now retiring at 55 years old. Pitre said she’s nervous and excited for her new journey to begin. After working at the Kingston Road and Bingham Avenue location in the Kingston Road Village, she admitted she’s nervous about the unknown but is looking forward to experiencing new things. Pitre plans to take a break during summer. Although she’s spent her career giving back to the community as a branch manager, she still plans to do more of it. “More of the reasons why I want to retire is because — I want to do more volunteer. I used to volunteer more, and now I really want to do more of that. I also want to start exercising, getting outside, gardening and all those sorts of things,” Pitre said. She doesn’t know exactly how ‘the after’ is going to play out, but she first want to spend time relaxing. A vacation trip is still yet to be planned. Pitre recalls many fun days at work; the most memorable times being connected to community involvement. She remembers the Christmas parades that the bank staff participated in, having attended for about 10 consecutive years. People in the community know her the bank staff are involved in local events. That’s one of the reasons why she stayed at this Kingston and Bingham branch for 14 years. “It’s the people. Honestly, the people in this community are so welcoming, warm, friendly, and down to earth. That’s the main reason why I stayed. If I were to move– I don’t think I would get that anywhere else. I’ve been to other branches, and they were all great. But this one — I don’t think it could get any better,” Pitre said. She said it’s not just the names of the people in the community, but also the stories behind them. Pitre also enjoyed spending time with her staff. They love what they do and she said that collectively– they made her look good as a branch manager. And all of them are wishing Pitre a happy and adventure-filled retirement. “Carolyn has shown to be such a loving and caring person, manager and leader. Through her compassionate ways, she has put many smiles on many faces. Carolyn has been such a supportive team player especially in giving back to our community,” Nazaleen Hussain, one of the staff,said in an email to Beach Metro News.